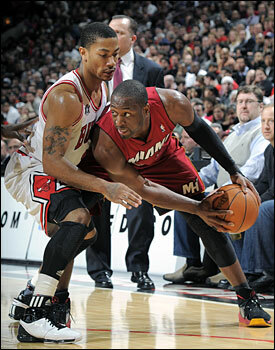 When the Eastern Conference Finals between the Bulls and Heat tips off Sunday at the United Center, Miami guard Dwyane Wade knows what to expect from the 23,000 or so on hand. But it’s nothing this Heat team hasn’t experienced before, he said. Following an impressive 4-1 series win over the Boston Celtics, Wade made it clear that the Miami Heat are not satisfied by simply reaching the conference finals. If the regular season is any indication, the Heat have some work to do. The Bulls were one of two teams to sweep the Heat this year, along with the Dallas Mavericks, but won the three games versus Miami by only a combined eight points. And while much of the discussion surrounding this highly anticipated matchup has focused on the three superstars in the series—NBA MVP Derrick Rose, Wade and LeBron James—Wade views it a little differently. Wade is also quick to give credit where credit is due, and in Chicago’s case, Rose is the deserving recipient of a lot of praise. But Wade also understands the Bulls are not a one-man show. Wade admitted Game 1 carries a little more importance being the opening matchup in the series, as well as the first time this postseason the Heat have opened a series on the road. But he insists he and his teammates are up for the challenge. Heat forward LeBron James may not have gotten as much sleep as he wanted Saturday night, but he took advantage of his early awakening. “Can’t sleep! To excited right now. Breaking down film til I fall back to sleep,” James wrote on his Twitter account at 5:38 a.m. Sunday morning. Given the Bulls outrebounded the Heat 131-90 over three meetings in the regular season, Miami forward Chris Bosh was asked about how his frontcourt might improve this time around. “We’ll just go get the ball,” said Bosh. “There’s no science to it. It’s just hard work and wanting it more than the other team. I think, collectively, we’re going to have to win the war on the boards because that’s the most important thing in this series.